This week I'm celebrating my birthday. My birthday is Sunday, June 3, 2012. I wanted to share some of my gifts to me that I have been collecting since I retired in February 2007... Just 5 years and I have collected a lot of stuff. Some of my favorite tea cups. 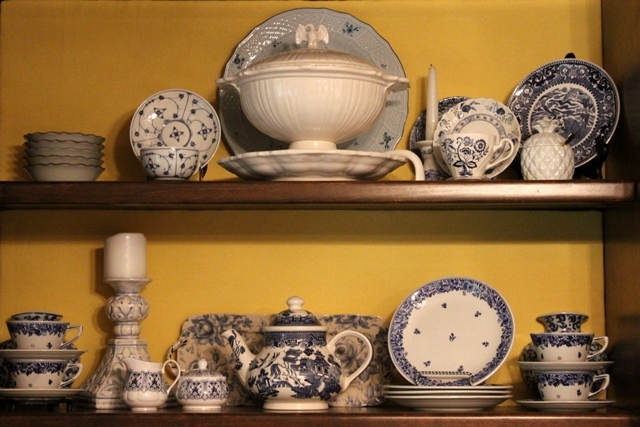 I love my blue and white dishes. This cabinet was used in the early days for a set of encyclopedias. As I have said before! I keep it everywhere. The Blue and White dishes got bumped from the cabinet over the television set. And now I have them displayed on top of the cabinet that holds the tea cup and saucer collection. I also keep my cake pedestal plates on this cabinet too. And, now my new favorite Pink and White dishes are in the cabinet (where the encyclopedias were). I made a red toile heart to match my dishes and I love the cloches and white soup tureen in the mix. This set of dishes are especially nice in the fall. I love to go antiquing. 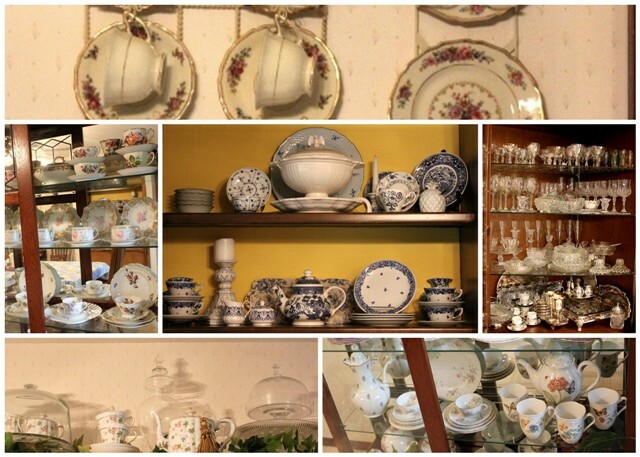 The top of the china cabinet is a great place to store these less used dishes. Wow, what a lovely collection you have! 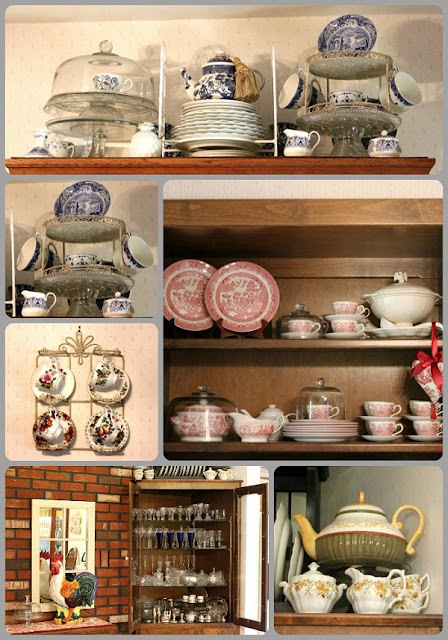 I could only dream to have that many dishes lol....Thank You so much for sharing your lovely displays with us and I hope you have a wonderful weekend! I confess, I'm a tea cup addict too. I have so many, I put myself in rehab and now I'm on the wagon. However, on occasion, I lapse into my old habit. But it's hard to resist something so pretty, so functional. There's nothing like a cup of tea in fine china. I love your collection and the little toile heart goes perfectly with the pink china. It's all so pretty! The pink and white set is gorgeous and I love the matching heart you made! There is something cozy and comforting about teacups, and though I haven't been bitten by that particular bug (yet), I love to see the teacups others collect! Thanks for sharing! Love all the blue and white and that pink! So much fun to see your "pretties"! Thanks for sharing. P. S. So glad you know everything - you can teach the hubby - lol!! Oh my, I love themselves of your dishes, but my favorites are the pink and white ones. I noticed that you have a folding plate stand!!! I've been wanting one of those. Thanks for the peek at all your pretties. Your dish collections are all so pretty and displayed so attractively. Thanks for the tour! You have such a wonderful collection. Everything is so beautifully organized. It is so great that you have things out where you can enjoy them every day. You have some beautiful things. Great to see where you keep them all. Great to have you be a part of Seasonal Sundays. You are organized and I have some patterns you have. I told my husband I am taking half a huge closet for dishes and he rolled his eyes but just a little. It is far better than a new kitchen after all. Wow, you have a lovely collection of dishes! You're ready for every occasion. Lovely dishes all and of course, I'm with you about blue and white! Oh I like all your plate racks. Some are so unique (to me anyway). Enjoyed my visit. Stopping by from Seasonal Sundays. You have a wonderful collection of such lovely dishes!